The Indianapolis Colts had raised concerns as far back as this past November about under-inflated balls supplied by the New England Patriots following its regular-season game against the recently-crowned AFC champions, ESPN reported. During that Nov. 16 game, Colts safety Mike Adams twice intercepted quarterback Tom Brady and gave the balls to the Colts' equipment manager to save. Both times there were concerns about the balls feeling under-inflated, sources earlier this season had told ESPN NFL Insider Adam Schefter. Those sources also said that the Colts raised concerns to the league, which was aware of the issue going into this Sunday's AFC Championship game. New England won the game, 45-7. Earlier today, the NFL said it is "continuing" to look into allegations the Patriots had 11 of their 12 allotted game footballs under-inflated this past Sunday. “We are continuing our review and will provide an update as soon as possible,” the league said in a statement today. According to ESPN, the footballs used by the Patriots were under-inflated by two pounds per square inch. Footballs, which are weighed before the game, must be inflated to no less than 12.5 pounds per square inch. A deflated ball could be easier for the quarterback to grip in bad weather, such as in Sunday's rain at Gillette Stadium in Foxborough, Massachusetts -- a theory Pats players did not agree with this week. League sources also confirmed to ESPN that the footballs were "properly inspected and approved" by the referee some two hours before kickoff. Each team provides 12 new Wilson Official NFL footballs for referees to check before games, with additional balls available for backup purposes or at the away team’s discretion. Former NFL official Gerry Austin told ESPN Radio what interactions the referees have with game balls both before and throughout the game, including when each team brings 12 balls to the referees' room ahead of kickoff. If the air pressure is low they bring it up. If it’s too much, they deflate it to the appropriate point. The balls stay with the officials until 10 minutes before kickoff. "They don’t actually weight the footballs. They do check the pounds per square inch. That is done every game," Austin said. Austin added that he had never encountered an issue where someone from a team had been letting air out of the balls after they had been handed over. 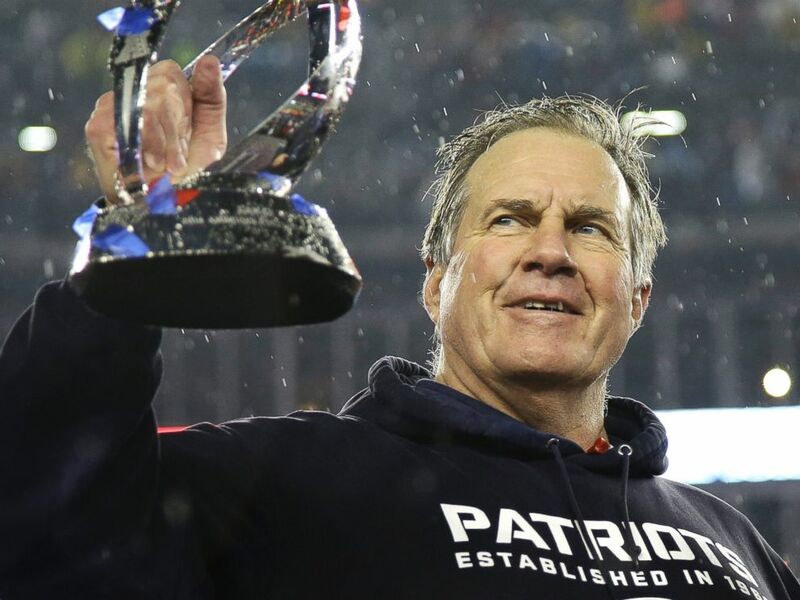 New England Patriots head coach Bill Belichick holds the championship trophy after the NFL football AFC Championship game on Jan. 18, 2015, in Foxborough, Mass. He also said that while referees do handle the balls later in the game between plays, that is such a small amount of time that it would be nearly impossible to notice. "You don’t even give that a thought. The amount of time you’re handling the ball is very limited," Austin said to ESPN. Though he does not have any specific knowledge about what happened in this weekend's game, Austin said that if the balls were deflated when half time rolled around, they would be brought back up to standard. The minimum disciplinary action for tampering of a football is a fine of $25,000, according to the NFL’s game operations manual. The controversy around “deflate-gate” has taken attention away from the Super Bowl, which will feature the Patriots playing against the Seattle Seahawks.